I love baking bread!!! When I was little (ok..ok, I still do) I used to read the Little House Books, by Laura Ingalls Wilder. I have read all of her books, the publications she used to write, books that were written by other authors about her female ancestors etc. I even went to Rocky Ridge Farm. I just love her books! It’s probably why I like to cook, quilt, crochet, garden and travel. Making food from scratch, holds a particular pride for me. I decided, when I got married that I wanted to stop buying bread. Nothing says home to me more than the scent of fresh bread baking. Now, even with being busy, I find that it is still possible because my mother-in-law had purchased for me a bread maker. I use it whenever I make daily sandwich breads. This time, however, I really wanted to make my bread by hand. There is a sort of satisfaction in doing so. Don’t get me wrong, I did use my kitchenaid to help with kneading (my countertops are way too high for me). The act of putting the dough together and letting it rise, shaping it and then baking it, is satisfying as well. This recipe is a Light Wheat Bread. 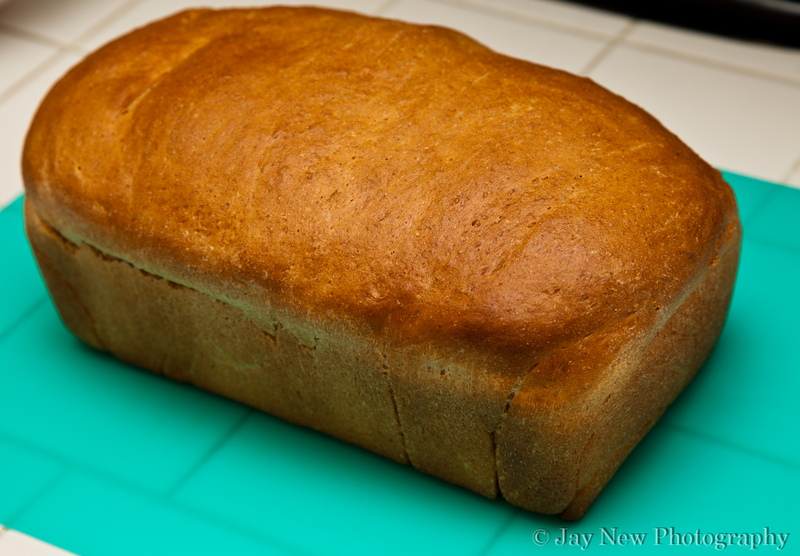 It has a mixture of both all-purpose flour and wheat bread. This bread is amazingly soft and makes great slices. After baking, I made this beautiful bread into grilled cheese sandwiches to go with my chicken noodle soup dinner. It was a big hit! For my husband’s sandwich, I used Yellow American Cheese and bacon. For my sandwich, I used yellow American avocado and bacon. These sandwiches were out of this world!! Combine ingredients and knead until dough is soft. Best way to see if it is kneaded enough is to stretch out the dough. If it rips quickly, it’s not kneaded enough. You want your dough to be elastic. Punch down dough and by hand press the dough into a rectangle about 3/4 inch thick. Using the short side of the rectangle, roll dough into a tight cylinder. Press the final seam closed with thumbs and then tuck then ends under the roll at the seams. Place dough, seam side down, into your bread pan. I totally understand the satisfaction that comes when u make something from scratch. And i must say, you did really well here! great looking breads! That bread looks perfect, looks like the one you buy in gourmet shops. Great! Great recipe. I use honey and powdered milk in a lot of mine too. This looks perfect for sandwiches and I love the slideshow. I have been on a bread baking mission of late – I am new to baking bread. Your loaf looks outstanding and your toasted sandwich even better. I don’t use powdered milk, what could I replace it with?